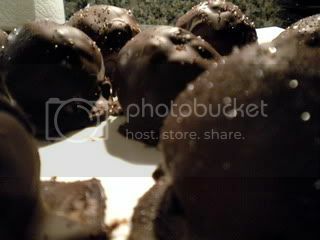 Kylie Rae Cakes: Quick and Very Easy Chocolate Kahlua Cake Pops!!! Some of my friends, from my Spanish class, and I are getting together for a movie night tonight with lots of yummy finger foods. So, being the baker that I am, I offered to make some cake pops. Unfortunately, after my 6 hour art class today, I came home to find I was out of the lollipop sticks... so I made cake balls (w/o the lollipop sticks)! Since I didn't have much time between coming home from class and having to leave for my friends house, I had to use my "I'm-in-a-major-baking-hurry" special weapon: Betty Crocker's cake box mix. Some of you might be speechless now, after I just appalled you with my dirty little secret... but the truth of the matter is that cake boxes are fantastic!! And yes, even pastry chefs use them every blue moon. 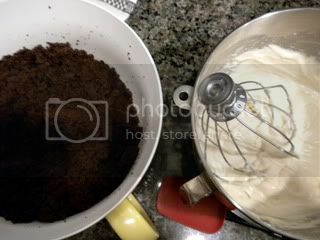 Ever wonder why a cake box mix always, faithfully comes out perfect, whereas your home-made attempt may be a little more inconsistent in its perfection?? The simple answer is that a cake box is designed by geniuses to be perfect every time. That's the whole point... they are pre-mixed boxes because they always work! That's why most people use them when baking... silly, right?!? Anyways, since I'm short on time I opted to use the "quicky mix", but I tweaked it just a bit - like I always do with any recipe I use. So, in essence, its still my unique recipe... kinda. 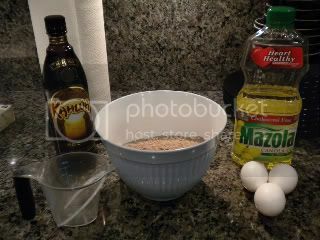 Here is the recipe, and I took some pictures so you guys could have a visual aid - I love visual aids since I'm a visual, and hands-on, learner. So here you go! 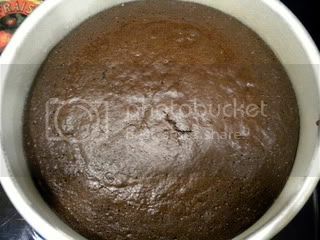 I prepared my cake pan (by spraying Pam Butter Flavored spray and dusted with flour), poured the mix in and then baked it for about 35 mins. Once the cake was finished, I let it cool completely. 6 oz. Cream Cheese - room temp. 7 oz. Unsalted Butter - room temp. 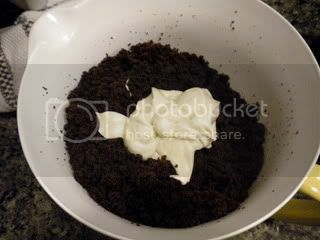 As the cake was cooling, I started on my Kahlua Cream Cheese frosting. 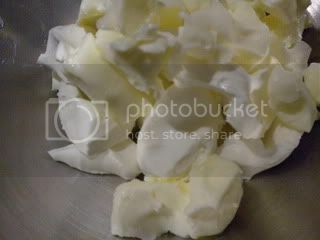 I creamed the butter and cream cheese together until light and fluffy. 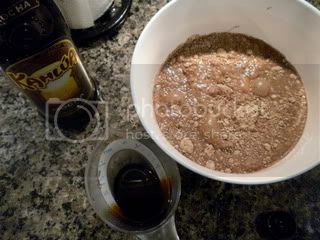 Then added the Kahlua liquor until it was fully incorporated. Once incorporated, I added powdered sugar one cup at a time. *After each cup of sugar, do a little taste-test to see if its too sweet, or not sweet enough [for you], then continue adding accordingly... or stop adding. Once frosting is completely mixed, set aside. Get a large bowl, and begin crumpling your entire cake into the bowl. 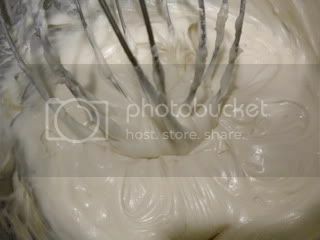 Add a dollop (medium-size) to crumpled cake and mix with a spatula. When the cake is moist, but not quite sticky, you're good to go. 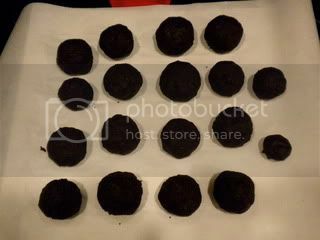 Have a sheet pan covered by parchment paper and begin shaping cake into balls (whatever size you desire) and place on sheet pan. When all the balls are formed, place in your fridge for at least 20 mins. so the balls can firm up a bit. Next, boil water in a double broiler. Once boiling, turn down the heat and just let the water remain at a simmer. Break your chocolate bar into pieces and place into a metal bowl - put the metal bowl on the double-broiler. Allow the chocolate to melt about 50% without stirring. 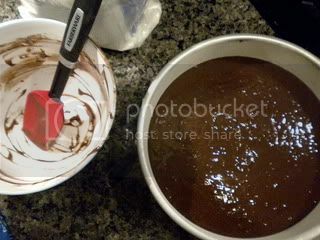 When the chocolate is almost completely melted, stir a bit till almost all chunks/bits disappear. Then take the bowl of the heat and keep stirring - the heat will continue to melt the last little bits, but you won't burn the chocolate... which is actually easy to do. 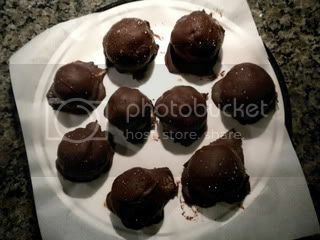 Using a spoon or spatula, cover the balls completely in chocolate and then allow them to set up at room temp. (Unfortunately my camara battery died for this part... so no pics of the chocolate business :( sorry guys). Be creative and decorate however you like! And lastly... ENJOY THE YUMMY-NESS!! what is a double broiler? and what did you do with the extra frosting?? those sound incredible! mmmmhmmmm... cake balls. I started making them awhile back and haven't done a batch in awhile. I fancied Red Velvets... and the guys at Refuge ate them up! britt: thanks... we should get together and make red velvet cake balls since red velvet is my ultimate fav! !